Collecta at St. Mark. Station at Sts. Cosmas and Damian. Under the high altar of St. Mark’s rest the bodies of the martyrs Sts. Abdon, Sennen, and Hermes, transferred thither by Pope Gregory IV (827-44). The stational Basilica at Sts. Cosmas and Damian we have already noticed as the place of the collecta on the second Monday in Lent. The Mass refers chiefly to the anniversary of the martyrdom, and the frequent mention of health, sickness, and healing recalls the great popularity of the veneration paid to the holy Anargyri (moneyless) in those early days. I am the salvation of the people, says the Lord. From whatever tribulation they shall cry to Me, I will hear them; and I will be their Lord forever. Ps 77:1 Hearken, My people, to My teaching; incline your ears to the words of My mouth. V. Glory be to the Father, and to the Son, and to the Holy Ghost. R. As it was in the beginning, is now, and ever shall be, world without end. Amen. I am the salvation of the people, says the Lord. From whatever tribulation they shall cry to Me, I will hear them; and I will be their Lord forever. May the blessed feast of Your saints, Cosmas and Damian, glorify You, O Lord; for on this day in Your marvelous providence, You gave them glory everlasting, and gave us their help. Through Jesus Christ our Lord, Who liveth and reigneth with Thee in the unity of the Holy Ghost, one God Forever and ever. R.Amen. In those days, the following message came to me from the Lord: Stand at the gate of the house of the Lord, and there proclaim this message: ‘Hear the word of the Lord, all you of Juda who enter these gates to worship the Lord! Thus says the Lord of Hosts, the God of Israel: Reform your ways and your deeds, so that I may remain with you in this place. Put not your trust in the deceitful words: This is the temple of the Lord! The temple of the Lord! The temple of the Lord! Only if you thoroughly reform your ways and your deeds; if each of you deals justly with his neighbor; if you no longer oppress the resident alien, the orphan, and the widow; if you no longer shed innocent blood in this place, or follow strange gods to your own harm, will I remain with you in this place, in the land which I gave your fathers long ago and forever,’ says the Lord almighty. The eyes of all look hopefully to You, O Lord, and You give them their food in due season. V. You open Your hand and satisfy the desire of every living thing. At that time, Jesus rose from the synagogue and entered Simon’s house. Now Simon’s mother-in-law was suffering from a great fever, and they besought Him for her. 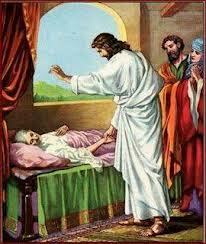 And standing over her He rebuked the fever, and it left her; and she rose at once and began to wait on them. Now when the sun was setting, all who had persons sick with various diseases brought them to Him. And He laid His hands upon each of them and cured them. And devils also came forth from many, crying out and saying, You are the Son of God. And He rebuked them, and did not permit them to speak, because they knew that He was the Christ. Now when it was day, He went out and departed into a desert place. And the crowds were seeking after Him, and they came to Him, and tried to detain Him, that He might not depart from them. But He said to them, To the other towns also I must proclaim the kingdom of God, for this is why I have been sent. And He was preaching in the synagogues of Galilee. Though I walk amid distress, You preserve me, O Lord; against the anger of my enemies You raise Your hand; Your right hand saves me. We offer You, O Lord, in honor of the meritorious death of Your just ones, this sacrifice which is the source of martyrdom. Through our Lord Jesus Christ Thy Son. Who liveth and reigneth with Thee in the unity of the Holy Ghost, one God Forever and ever. R.Amen. O Lord, we ask You through the merits of Your blessed martyrs, Cosmas and Damian, that Your holy sacrament will assure us of salvation. Through our Lord Jesus Christ, Who livest and reignest, with God the Father, in the unity of the Holy Ghost, one God For ever and ever. R. Amen. May Your heavenly favor, O God, increase the number of Your subjects, and help them always to obey Your commands. Through our Lord Jesus Christ, Who livest and reignest, with God the Father, in the unity of the Holy Ghost, one God For ever and ever. R. Amen.